Quilt Inspiration – Where Do Pattern Ideas Come From? 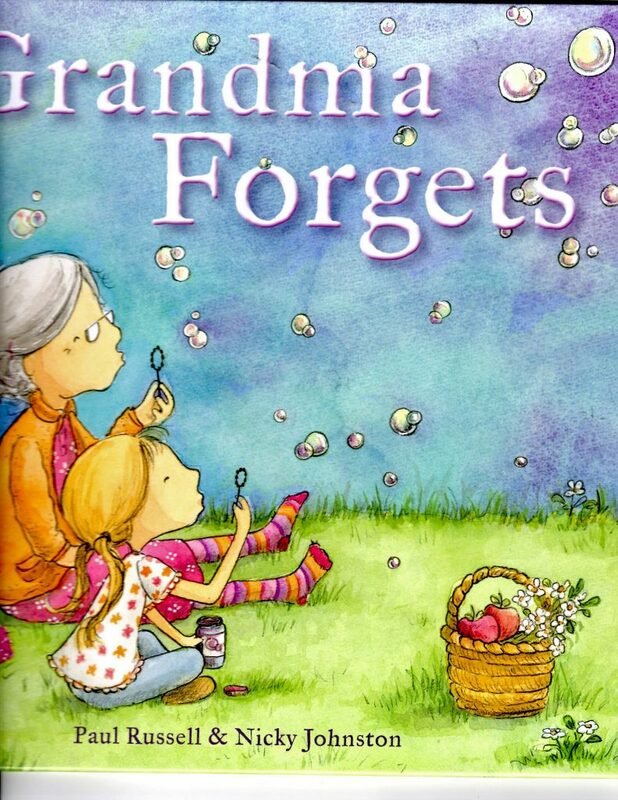 As quilters, part of what we attempt to do is preserve memories. We preserve them in fabric – like a snapshot. 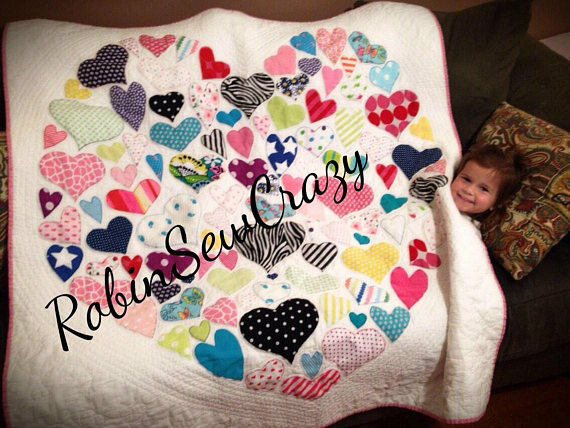 Last week online, I came across this adorable photo of quilt with a little girl nestled underneath it. I mean…just look at that little face! She’s so precious. 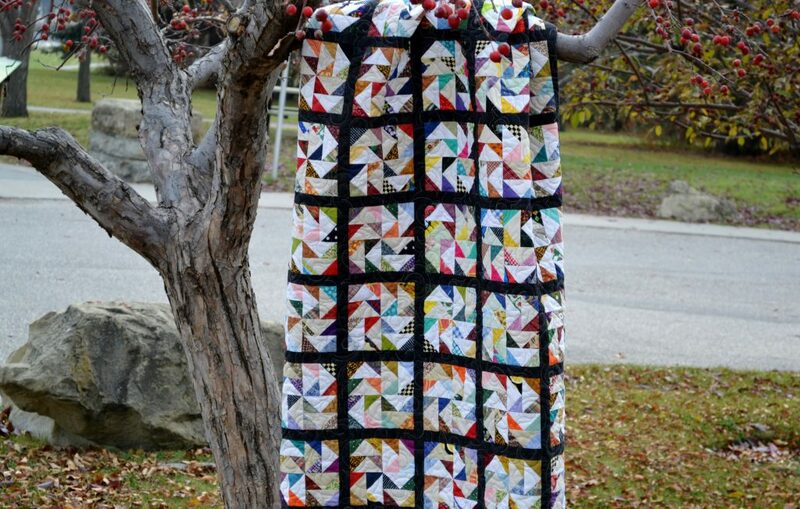 The quilt was designed and stitched by Robin from RobinSewCrazy. In 2007, she opened her shop on Etsy. 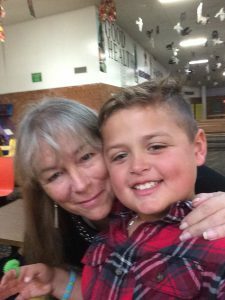 Here she is with one of her grandchildren. Memory quilts are her specialty…she uses her client’s old/too small clothing as fabric for the applique hearts on the quilt top. 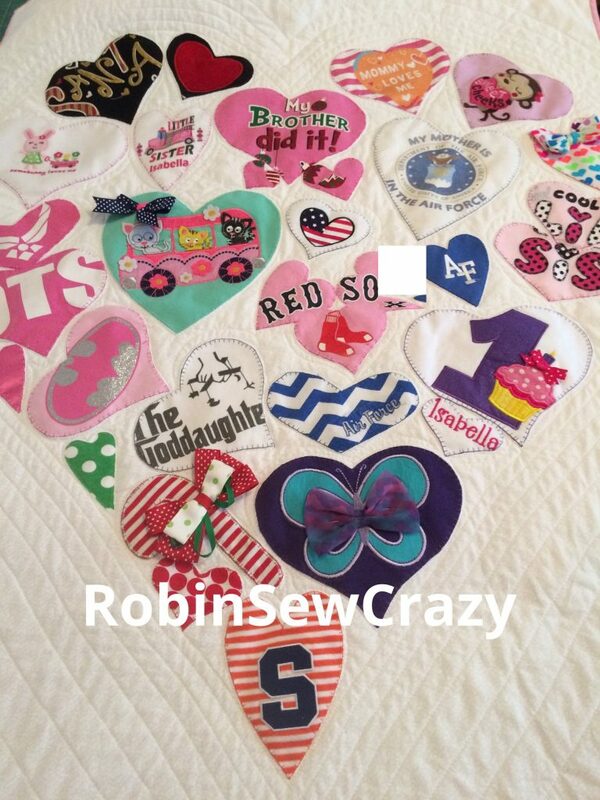 Robin does not use a pattern for her work, creating each quilt individually and custom to her client’s request. Robin’s quilted creations capture the imagination. Just looking at them makes me happy! I love the menagerie of fabrics and colours, and they way they all mesh together in the end. Who doesn’t love a Challenge? A Quilt Challenge that is. Several months back, sometime in 2016, I came across this fabulous fabric line called With Glowing Hearts. It was designed by a lovely young and talented Canadian designer named Grace Noel. I bought a lot of this fabric from Dinkydoo online and I totally fell in love with it, especially the first fabric featured here; the teal one. Teal and Red. What’s not to love? Grace designed her fabric collection for TrendTex to commemorate Canada’s upcoming 150th anniversary (called a sesquicentennial by the way). Once my package of fabrics arrived in the mail, I sat down and drew out my idea of what a Canadian celebratory quilt might look like. Initially, all I was interested in was designing and stitching and creating a project fellow quilters would want to make. So, tweaking my design drawing as I went, I have finished the quilt top; it’s a row-by-row style actually. The simplicity of my design really allows the fabrics and colours to shine. Then, I read Quilter’s Connection Winter issue featuring Grace Noel and her work. 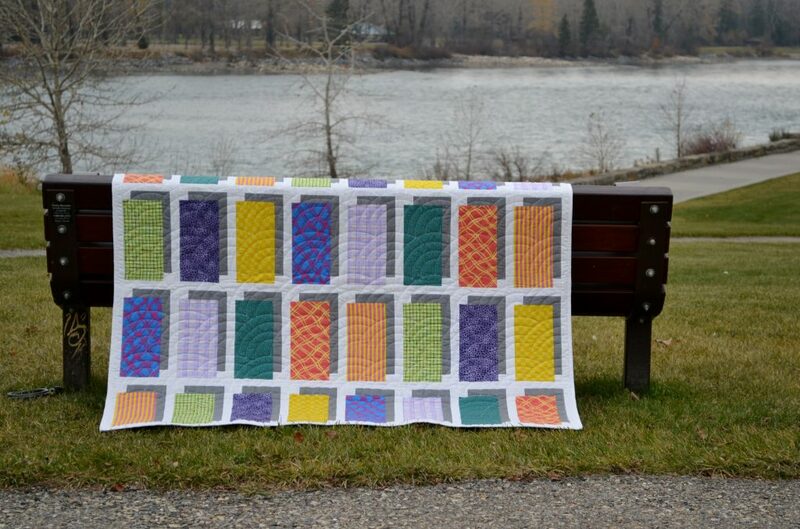 Grace announced that TrendTex was sponsoring a Quilt Challenge….using her inspirational fabric collection. They are calling it With Glowing Hearts – Quilt Challenge 2017. So once I have finished machine quilting my top I may enter it in the Challenge. I’ve never done that before so I think it could be fun. Your quilt must have a minimum of six fabrics from the With Glowing Hearts collection. You can only use With Glowing Hearts fabrics AND coordinating Bella Solids. Embellishments and threads will be accepted. Sounds like fun, right? Prize money ranges from $750.00 down to $100.00 and winning entries will be showcased at the International Fall Quilt Market in Houston at the end of October, 2017. Quilts must be submitted to participating quilt shops by July 31, 2017….you can find a list of participating shops right here. And you can find more detailed contest details right here. I originally published this blog post on October 21, 2016. I wanted to republish the post – as Nancy Basserman has recently passed away. I only came to know Nancy several months before she passed….she was a lovely lady, very kind and very sweet and a wonderful quilter. May she rest in peace. 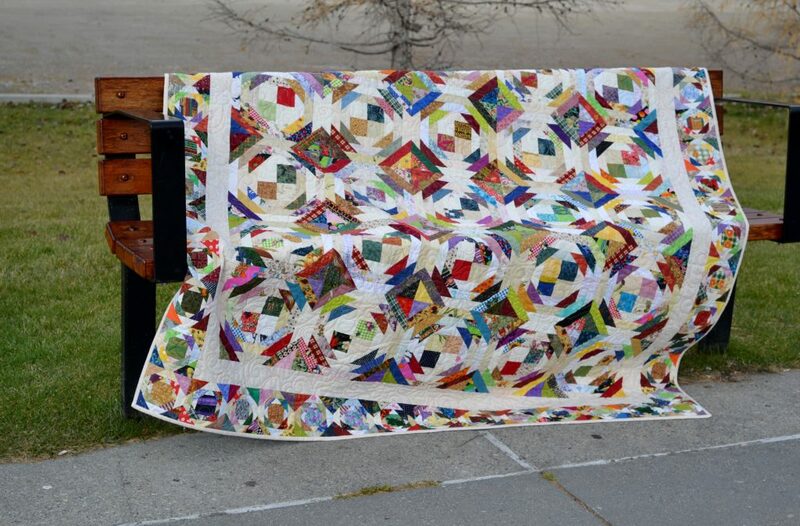 Earlier this week, I took to Baker Park to photograph some of Nancy Basserman’s lovely, scrappy quilts. When I arrived, the sun was shining and the birds were singing. Not fifteen minutes later, the skies clouded over and it was threatening to snow. 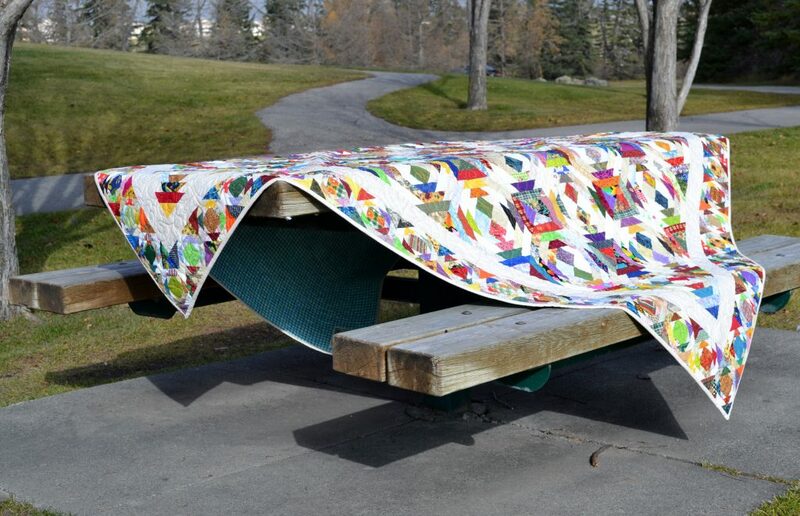 With or without sunshine, Nancy’s quilts sparkle especially in the beauty that is Baker Park. 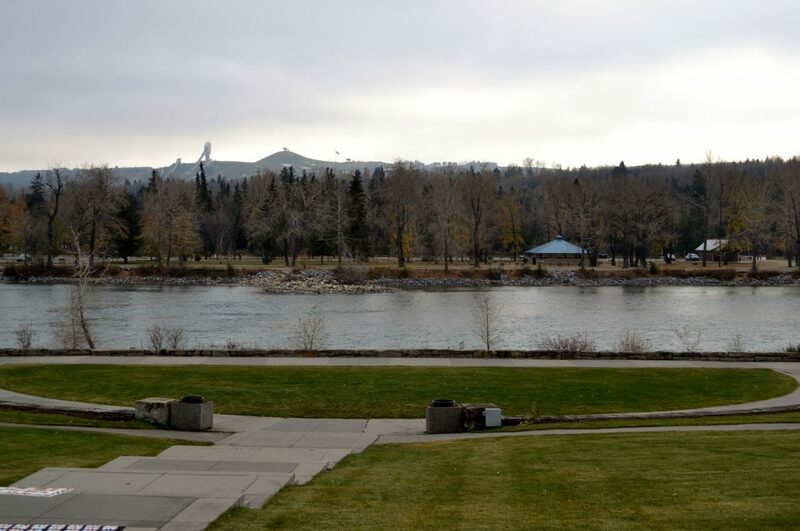 Across the Bow River from Bowness Park, it is a little known gem of nature, walking paths and greenery. In the background, Canada Olympic Park and our ancient ski jump built for the 1988 Olympic Games. Even though the cold had started to blow in, there were some people in the park, riding their bikes or walking their dogs but it was mainly deserted. Just right for me to snap my photos! Nancy’s amazingly striking scrappy pineapple quilt drew me in right away. It is so pretty and so scrappy and so attractive. Nancy has a penchant for making flying geese – and she does it very well. 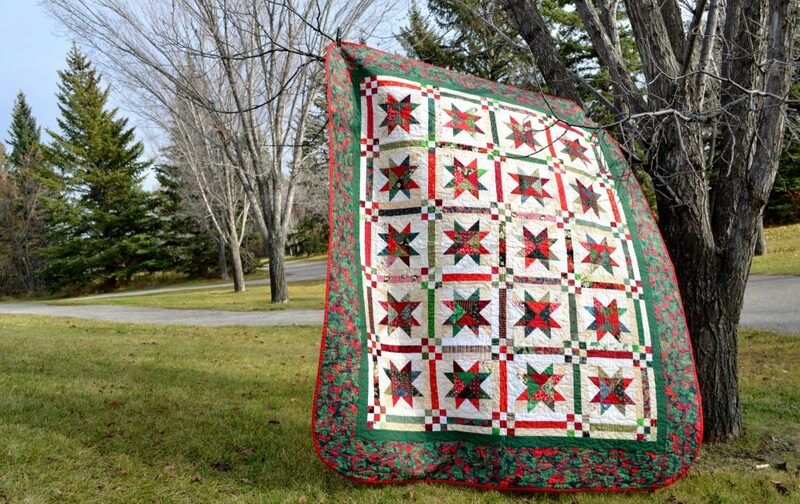 This beauty demonstrates both Nancy’s piecing and quilting skills. 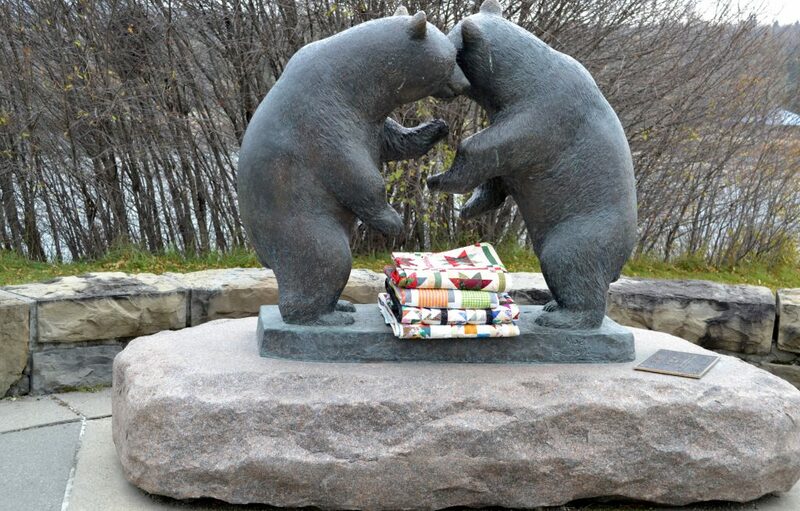 Baker Park is home to a pair of bronze twin bears Leo and Mol. The statue stands near the center of the park; an interesting twist to the beauty of nature that surrounds it. 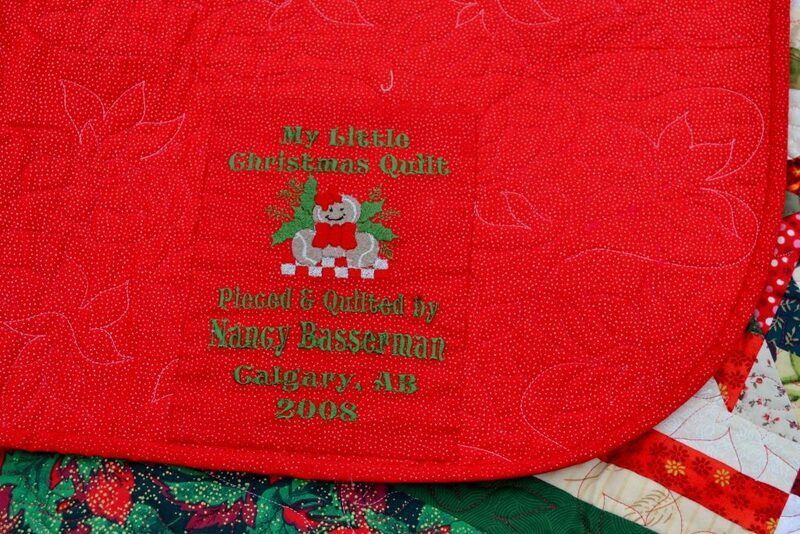 A sweet little Christmas quilt is one of Nancy’s favourites. I call this quilt “In the Shadows” – probably not what Nancy calls it but I love it for the shadowy effects each block portrays. Next time you’re out and about in Calgary looking for a wonderful place to walk or sit and think check out Baker Park. Nancy’s quilts will not be there but you will love the nature that surrounds you. Whenever my work is published, whether a quilt project or a written article, I’m beyond thrilled when I see the proof in a quilting magazine. That thrill never diminishes. There is feedback, validation that your work will interest someone else. It’s great! Recently, Quilter’s World published an article of mine entitled Young Ideas, Old Traditions on page 80 of the Autumn 2016 issue. Initially, this article was written in 2014 at the behest of the editor of The Quilter magazine. I researched the piece interviewing young quilters – Telene Jeffrey of South Africa, Erin Brophy of New York, Britney Chrisinger of California, Katrina Lloyd of Texas, Gina Tell of Iowa, Jeena Lugo of Utah, and Jennifer Lipman from Arizona. Unfortunately, The Quilter magazine went under and my piece went unpublished. Undaunted, I began the search for a new publisher sometime in late 2015. 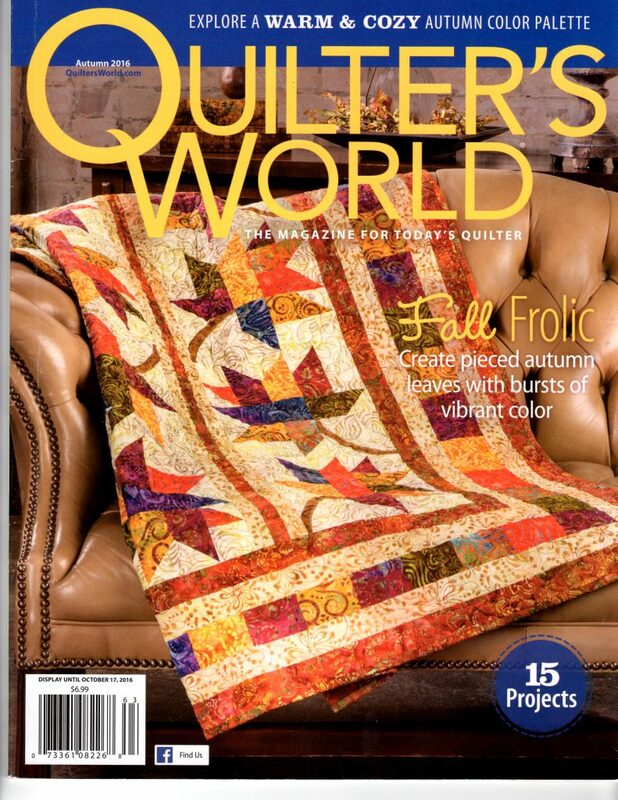 I queried Quilter’s World with my idea in early 2016 and they accepted it! Two years in the making didn’t dampen my joy of being published; in fact, I think it made it a little sweeter. The ladies I worked with and interviewed for the article were astounding! First, they are all young quilters, carrying on a very old tradition. Second of all, they were wonderful to deal with; funny and interesting and delightful. It was my distinct pleasure to “meet” each and every one of them. I’m actually hoping I get a chance to work with some of them again in the near future. But sadly, quilt magazines are disappearing. 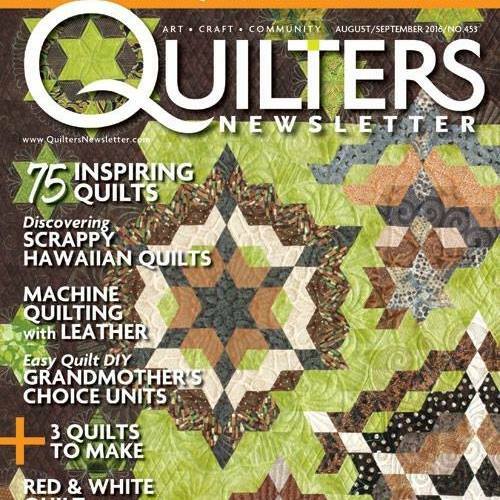 Earlier this month, we learned that Quilter’s Newsletter would no longer publish after the Oct/Nov 2016 issue. They have been publishing for almost fifty long years! Working in the past with Quilter’s Newsletter on many of their special issues was truly wonderful for me. I will always cherish the help, assistance and direction of editors Mary Kate Karr-Petras and Carolyn Beam, not to mention Lori Baker. All the best to each of you ladies and thank you so much for all that you did for me. I had a quilt project scheduled to be published with Quilter’s Newsletter that will now not appear on their pages. A similar experience happened to me when Quilter’s Home met its demise. (GenQ magazine rose from the ashes of Quilter’s Home). The point is, publishing in the quilting world is changing. The trick is to being ultra patient and evolve with the times. I basically have the attitude of “never give up” and it has served me well. Cindy Brick wrote a piece on her blog about the new world of quilt publishing and it’s definitely worth a read.